Why should my Freeview reception change when I have not changed anything? From time to time people find that their Freeview box, integrated set (idTV) or Personal Video Recorder (PVR) has lost many channels without any apparent changes. Freeview is broadcast on digital multiplexes. This means that, once broken down into a stream of bits, each television channel is combined into a single transmission of 1s and 0s. This means that reception is of the multiplex first if this is lost it affects all the channels in the multiplex in the same way. The signal strength received by the box or TV for a particular multiplex from a given transmitter determines if the data can be received or not. So, a poor signal results in no data, an adequate signal in perfect data and a low signal in either none or all. Poor digital signal levels do not result, as they do with old-fashioned analogue television, in a sub-standard picture or sound. 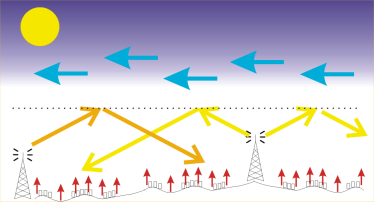 Poor signals often result in a perfect data-stream, but are prone to periods of no reception. Sometimes this will be for hours, but can also be several times a minute when caused by induction from fridges, freezers, central heating systems, two-stroke scooters, baby monitors and so on. First disconnect the aerial lead from the Freeview box or TV set and reconnect it and then follow this reset procedure to scan for channels again. If this does not result in services being restored, check the Freeview transmitters page to see if there are any engineering problems with your local transmitter. Factory-fitted connectors are very reliable as they cannot easily be taken apart, but they can be damaged by wear and tear. On the female-type the central section is often composed of two parts which can often be forced apart, resulting in a poor connection you can push them back together if this has happened with a pair of tweezers. On male connectors if the central pin is damaged, you will need a new cable. If there are any loose partials in the connector, remove them. Another problem with these cables is that quite easy to sprain the connector at the back which causes little obvious external damage, but disconnects the internal connection. This happens often when a set-top box is pushed backwards into a cabinet. Hand made cables can also suffer from similar problems to factory made ones and they are also prone to accidental damage from a cable being pulled. If such a connector is not firmly attached to the cable, the connector may need refitting. If the cable has been slashed or cut, it will not be very effective or reliable. If such a cable is fitted externally, this can allow rainwater to enter the cable and this will reduce the signal levels. You can easily damage an RF cable by crushing it, for example in a door. If the outside of the cable has a permanent kink in the cable or has been very tightly looped, this could be the site of damage. For reliable and effective Freeview reception, a rooftop aerial is required. It is hard to make a visual check of such an aerial without putting yourself in potential danger. You can make a visual check of the route between the aerial and the transmitter. Any form of obstruction will damage the digital signals. In particular trees coming into leaf, as these will leech the signal before it reaches your aerial. This applies to both trees adjacent to the aerial and at a distance. Another common problem in cities is building work. A large crane will often change position many times during the day, and if this is between your aerial and the transmitter this can reduce the signal levels in an unpredictable way. If your system uses a booster, the power may have failed. Check the fuse to the power to the booster. There are two main weather problems that effect Freeview reception. The Inversion Effect: please see What is the Inversion Effect and why does it effect my Freeview TV reception? Wind: high winds sometime can dislodge the aerial this results in a poor signal. Rain: poor or old cables can fill with water and this results in a poor signal. If this happens, the cables will require replacement. Paul Smith: At a guess, atmospheric conditions have caused services from a French transmitter to travel further than normal, which happen to be broadcasting on the same frequencies as the transmitter you normally receive. To give any specific advice we need to know where you are (please provide a full postcode) so that we can see which transmitter you're meant to be receiving and your predicted coverage etc. Hi, I have been without any TV for the last 9 days. I initially had problems with Sky News breaking up, eventually I lost everything other than BBC1 and 2. These then both disappeared 9 days ago. I have re-tuned my TV but to no avail. I am on the verge of contacting an engineer but found this website and thought I'd see if you had any advice. I have a roof top aerial and a Freeview TV. There is no problem with the Sutton Coldfield transmitter. If there were then ove a million people would have been affected and complained. Please check all your aerial connections, unplugging all coaxial plugs/sockets and refitting them. Then check what programmes you can receive. Nearly all problems such as you report are due to aerial system faults. I live in N Wales - 9 miles from Moe l-y-parc transmitter, As of five days ago I have received no signals. I did a retune - no change, I did a manual tune on channel 45 and received a heavy pixilated picture of BBC wales, does anyone know if the transmitter is off line? The transmitter is not reported to have any problems. As it serves a large number of people many would have complained if there was. I suggest you check all your aerial system, the cables and all connections. Unpolug and refit all coaxial plugs/sockets to clear any corrosion/oxidation from the contacts, that is a common cause of the problems you report. You should not have tried retuning, all that achieves is losing all tuning information the TV already had. Since retuning on Wednesday 27 March 2018, all six HD channels plus More4+1 now experience a short silence and glitch in the picture every 116 seconds. These - and only these - channels share a Mux. To whom do I report this fault? Lee: The Torquay Town transmitter has changed frequencies on 27th March, which may require a new aerial to be fitted. If you don't have satellite or cable you can contact the Freeview Advice Line (see link below) who can arrange for a replacement wideband aerial to be fitted free of charge. Since retuning on Wednesday 27 March 2019, all six HD channels plus More4+1 now experience a short silence and glitch in the picture every 116 seconds. These - and only these - channels share a Mux.